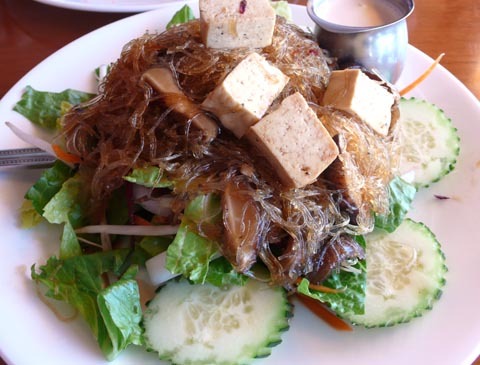 the vegan joint is definitely one of my favorite thai-inspired vegan restaurants with the word “vegan” in its name here in los angeles, and as you probably already know, there are SEVERAL. i usually steer clear of the various curries and noodle dishes (after all, if that’s what i want, i can always go to toi) and opt for salads, sandwiches, or wraps…all of which the vegan joint does quite well. the service is pretty hit-and-miss at the vegan joint, the atmosphere is kinda blah and the portions are small, but the food tastes great and it’s cheap as hell. if you wanna eat at an asian vegan place, i definitely recommend the joint. i’ve been pleased with everything i’ve tried on their menu. because the portions are small, we usually order a lot of food—two dishes and a salad or appetizer between us. this time we started with the amazing oriental tossed salad. 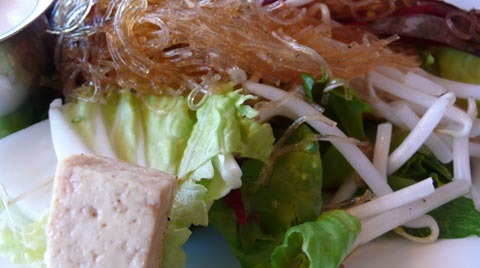 the lettuce was fresh, the tofu was cool, and the noodles were crisp, damp and refreshing. this salad was the perfect pre-meal on a hot spring day in los angeles. it arrived very quickly too…good thing, ’cause we were starving. 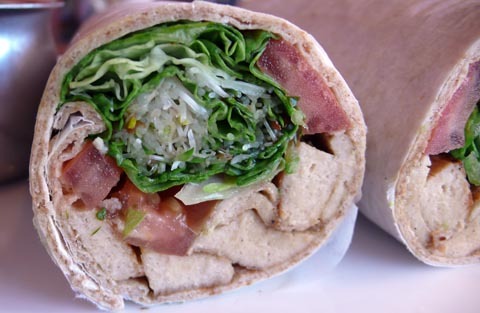 the seitan wrap from the vegan joint has been one of our favorites for a long time. many other thai vegan restaurants have not mastered the wrap—they serve a huge wheat tortilla stuffed with fake meat and overflowing with a mishmash of drippy condiments and produce that hemorrhages all over my plate before ever reaching my mouth. i’m happy to report that the wraps from the vegan joint don’t have this problem. rolled tightly in a soft piece of chapatti bread, they remain intact ’til the very last bite. 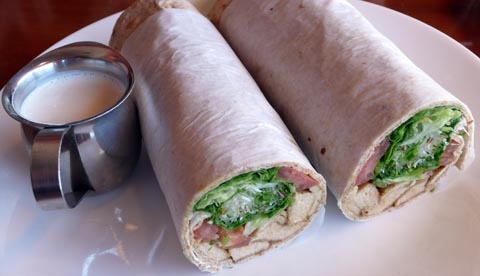 the seitan in this wrap is delicious, i just wish they’d put more of it in. it’s actually quite deceptive because all of tasty innards are gathered right at the front of the wrap; it you’re lucky you get over halfway through before you start biting into nothing but bread and sauce. lastly, the blt isn’t much to look at, but it’s satisfying and is a great value at just under $4. 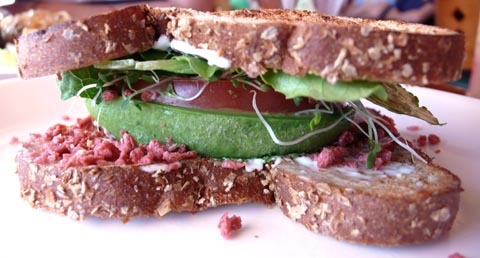 i’ve never had it with the vegan cheese—being such a huge avocado fan, i can never resist the urge to substitute. 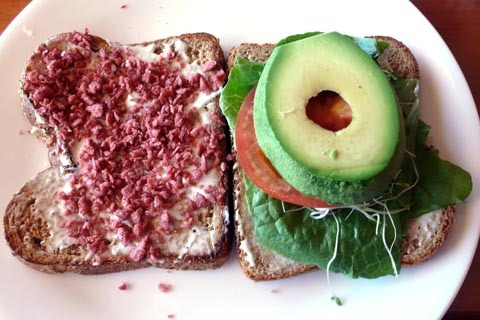 the crumbly bacon bits are crunchy and flavorful, too bad most of them end up on the table! overall, i recommend the vegan joint if you want some quick, tasty food on the super cheap. just don’t expect great atmosphere (it’s kinda thrown together and nondescript), excellent service (it takes a while to be noticed) or large portions (hence the half-full seitan wrap). that being said, i always leave the vegan joint satisfied and looking forward to my next visit. the food is pretty damn good, especially for a thai-vegan restaurant, and they offer so much more than non-meat and salty noodles. maybe I’m a cheapskate, but that food *does* look good, and I get the feeling I’d frequent that place a lot. that salad looks perfect! The Vegan Joint is amazing, they have the best papaya salad (I get it spicy) and their fresh spring rolls with peanut sauce are fantastic… I’ve never had anything there that I didn’t like. I’ve never eaten at their restaurant though as we always have it delivered at work. I ate there once and thought it was just ok. 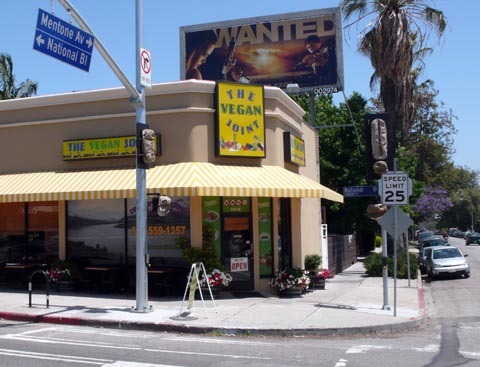 There is a similar restaurant called “LA Vegan” (the name is not too original) located on Centintela Blvd in Culver City. The menu (ex. “cowboy” chicken is on both menus) is strangely similar and always wondered if they were owned by the same family. The food there is great and their setain wrap is just divine!! There are so many Thai type vegan restaurants opening all over the place. I hope they all survive. However, I always wonder if the Asian commercially made mock meats are actually vegan. I love this place! Get the Cowboy Burger (drool…) and the spicy noodle soup! And the Thai Iced Tea! Thanks for making me drool in my cubicle! Vegan Joint is one of my favorite places to eat! The Cowboy Burger aka Garlic Chicken Burger is by far the best thing there! It is so delicious! I would suggest adding avocado. I have tried many things on the menu and they have all been great! Just writing about this place makes me want to go there now!